If you have visited the coast recently you may have noticed something magical is happening there – the shoreline is alive with water birds. From the New Forest to West Wittering and all along the northern coast of the Isle of Wight, 125,000 birds visit the Solent from faraway places such as Siberia and Greenland. The area is lucky to be host to such magnificent waders such as the curlew, and wildfowl like the shoveler, which every winter escape the sub-zero arctic temperatures. Life on the Solent for the birds means that although they do not have to worry about predators such as an artic fox sneaking up on them, they do instead encounter the distraction of human activity. Without realising it many people who visit the coast at this time of year can be a cause of disturbance to the birds whilst they rest and feed before their long journey back to their breeding grounds. Fortunately, Bird Aware Solent has a team of rangers that tour the coast speaking to people who visit the areas where the birds are in abundance. The length of coastline that Bird Aware monitors is a massive 254km, meaning there are lots of special places along it that the team enjoys visiting. Locations such as East Head, near Chichester for the feeling that you are somewhere abroad; Seaview Duver on the Isle of Wight for its pure seaside beauty; and Fishbourne for its tranquillity. When you next take a trip down to your local Solent beach keep your eyes open for the Bird Aware rangers. If you see them be sure to ask them what they have spotted. It could be a little egret shaking its foot to attract prey in the shallows or a kingfisher sat poised unflinching waiting to catch its next meal. Whatever it is, it won’t be hard to get consumed by the thrill of the natural world in all its glory. 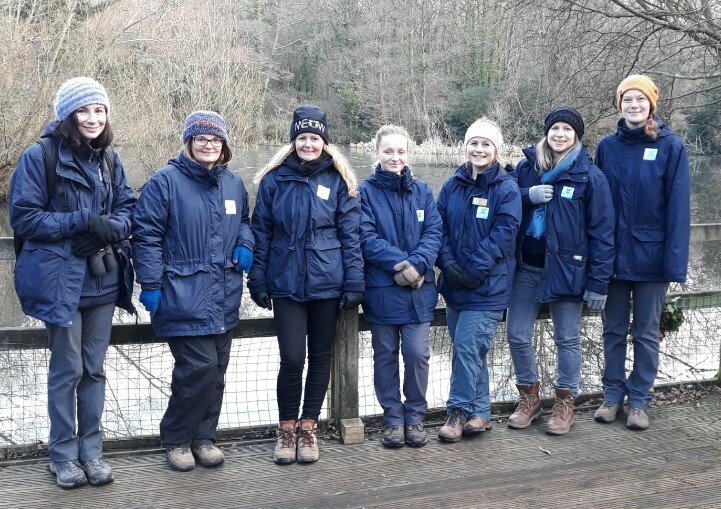 Representing the partnership (from left to right) are Sarah Lawrence, Seasonal Ranger; Natalie Hands, Ranger; Anna Parry, Partnership Manager; Lizzie Hibberd, Ranger; Amy Hopley, Seasonal Ranger; Karima Englefield, Lead Ranger; Ruth Papworth, Seasonal Ranger. Bird Aware Solent is an initiative that raises awareness of the shore birds that spend the winter on the Solent.